Where do our weekly, bi-weekly, or monthly paychecks go? Americans confess how they spent their paychecks. Living paycheck to paycheck in the United States affects more people than you think. In fact, more than 3 in 4 Americans who work full-time currently live paycheck to paycheck. And it isn’t just a problem for lower-income earners – 1 in 10 Americans earning over $100,000 a year still don’t feel like they can make ends meet. Research shows that as people earn more money but ultimately overstretch their weekly and monthly budgets, the buildup of debt can become a vicious cycle. While it’s sometimes easy to spend too much on impulse purchases, even simple smaller purchases can add up to a big expense and drag your finances down. So where do those weekly, bi-weekly, or monthly paychecks go? To find out, we surveyed 1,000 employed Americans about how often they get paid, how much of their paychecks they’re spending on unnecessary purchases, and how often they experience post-purchase regret. Are you curious to find out just how many people with $20,000 (or more) in debt think they spend their money wisely? Read on to learn more. With the exception of people getting paid on a weekly basis, men and women who told us their paychecks processed either every other week, once a month, or twice each month generally spent their earnings completely before receiving a subsequent paycheck. On average, people paid once a month said they spent their entire pay within 21 days, leaving a full week or more without cash funding to fuel their purchases. Regardless of their level of income, only 1 in 4 people claimed to always spend their paychecks wisely. More than half said they often spend their earnings responsibly and only 1 in 5 Americans said they sometimes allocate their money carefully between paychecks. And just where is all of this irresponsible spending going? For 15 percent of people, it went toward purchases to prompt an improved mood or some entertainment time. While 10 percent said they overspent for either impulsiveness or simply a desire to shop, what’s curious is the nearly 10 percent who overspend because they live beyond their means. If you aren’t putting any money into savings, your credit score is low, or more than 30 percent of your income goes toward putting a roof over your head, it could be almost too easy for you to fall into this category. When it comes to irresponsible spending, larger purchases may often leave people feeling guilty about having fronted the funds. Nearly 1 in 10 people told us they’d doled out the dough for a new TV knowing that it wasn’t a good idea. Despite decreasing market prices, the average American we surveyed spent over $2,000 on their television. Sixteen percent told us they regretted the purchase afterward. While vehicles were less likely to be identified as irresponsible purchases by those we polled, the average price tag for a new car was over $19,000, and 2 in 5 people told us they regretted buying one afterward. Even sticker shock may not dissuade someone from making an untimely, and costly, purchase. Whether you buy or lease a car, driving away with a new vehicle will usually cost you. Financial experts suggest that overspending on your car could be one of the biggest financial mistakes a person can make, and new car purchases should be spaced 10 years apart to capitalize on the investment. If you think you’ll want something new more often than that, consider leasing or buying a pre-owned vehicle to help minimize high monthly payments. While over 6 percent of Americans told us they overspent on vacations or trips and that the average cost was more than $1,600, over 95 percent of respondents said that they did not regret spending the money – even if it was irresponsible. Perhaps they’re more interested in the health benefits a vacation can offer and less concerned with their strained bank accounts. Regardless of how often they were paid, we found it takes women less time than men, on average, to spend their paychecks, despite allocating less money overall to irresponsible purchases. Women who are paid once a month said the money had usually been spent within 20 days, two days faster than their male counterparts. Those women who are paid twice a month said it only took 11 days to spend it, six days sooner than men paid on the same cycle. 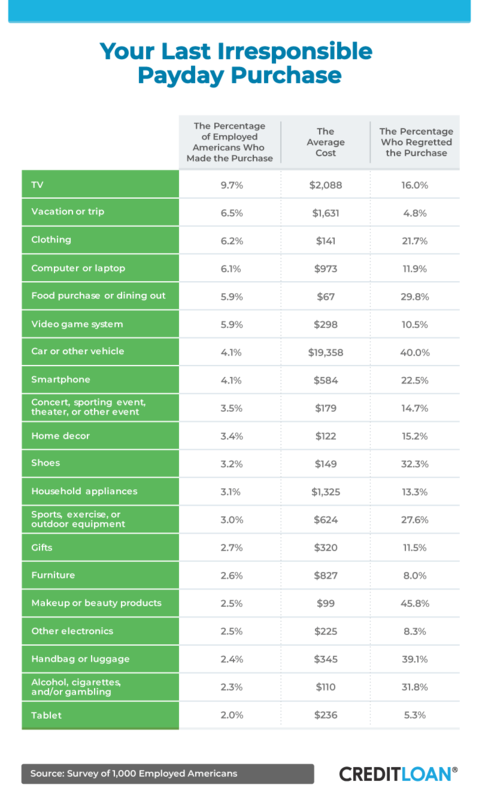 While TVs were generally the most common unnecessary purchase for men, 9 percent of women said they were overspending on clothing instead. Clothing sales may be falling in general, but costlier fashions have been replaced with inexpensive and potentially disposable choices instead. With more styles to choose from and more replacement purchases, more clothing becomes waste in the end. Common reasons for routine wasteful spending included a desire to dine out, according to 12 percent of women, and just to have fun or improve their mood, according to 20 percent of men. Between 2015 and 2016, in fact, the average American spent more money at bars and restaurants than grocery stores for the first time ever. Considering pizza could cost you an average of $13 in some parts of the country, eating out can certainly add up. For people who enjoy a meal out, you don’t necessarily have to quit cold turkey to adjust your finances. Even just reducing the number of times you go out by two or three times a month can save you $1,000 or more over the course of the year. 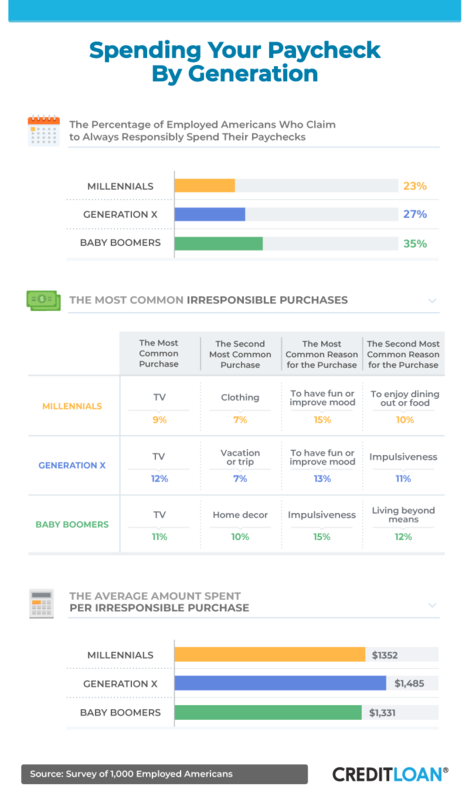 According to our survey, millennials were the least likely generation to admit spending their paychecks responsibly all of the time, though the most common irresponsible purchase was the same across every age group: a TV. Millennials considered clothing to be their second most common wasteful spending category, followed by vacations and travel for Generation X Americans and home decor for baby boomers. Despite being on a fixed income or at least preparing for retirement, we found more than 1 in 10 baby boomers admitted they overspent on unnecessary purchases because they wanted to feel as if they were living more luxuriously than they could afford. Spending too much too soon in retirement can be one of the biggest mistakes new retirees make going into their golden years. Sticking to a successful budget can help avoid accidentally squandering precious resources. It can be quite costly to re-enter the workforce once you’ve retired, and adhering to a budget can avoid many unfortunate outcomes that result in poor planning. Working in a higher paying industry doesn’t necessarily mean your impulsive purchases will be more expensive than those of someone who earns less annually. While the average base income for Americans working in manufacturing amounts to less than $42,000 a year, we found their most recent irresponsible purchase amounted to over $3,400 on average. 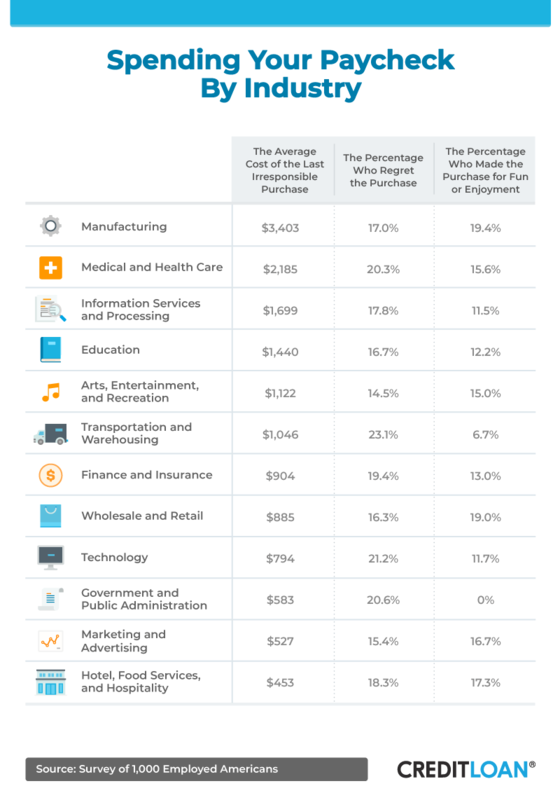 Despite being the most likely to spend arbitrarily for fun, 17 percent of respondents in the manufacturing field told us they regretted spending the money once the excitement of the purchase had worn off. In contrast, we learned Americans working in government and public administration, marketing and advertising, and hospitality spent less than $600 on their last irresponsible purchase. According to people working in government, 1 in 5 regretted spending the money, yet none of the people we surveyed within this sector said they made their purchases for fun or enjoyment. People living in Southern states including Texas, Florida, Georgia, and Alabama may have a different perspective on what it means to spend their paychecks responsibly. While 29 percent of Americans we polled from the area alluded to always spending their earnings responsibly, they also admitted the average amount of money allocated to things they didn’t necessarily need eclipsed $1,700. Only Americans living in Western states like California and Nevada spent more (over $1,900), with about 23 percent saying they always spent their paychecks responsibly. 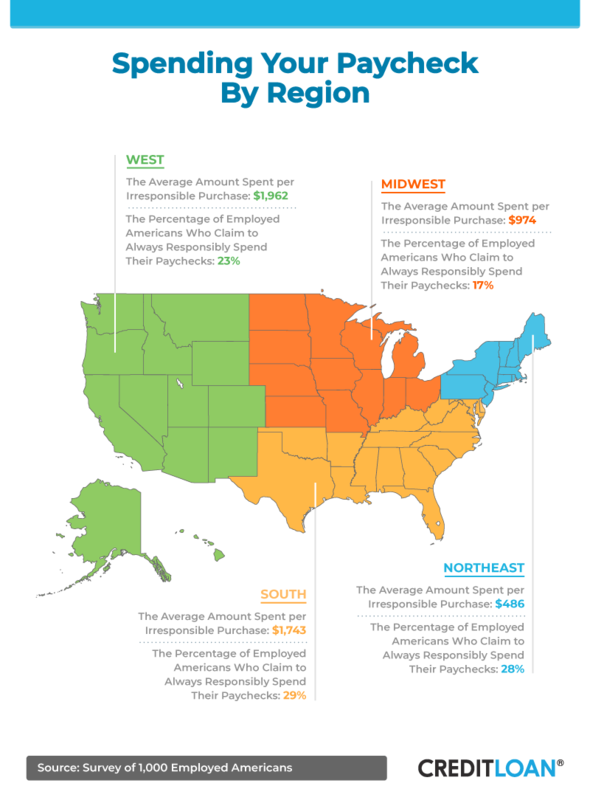 In the Midwest and the Northeast, irresponsible buying might be managed more carefully. In states like New York, Maine, and Vermont, reckless spending averaged less than $490, while the Midwest was nearly double at $974. Only 17 percent of Americans from the Midwest said their spending habits were completely flawless. You probably don’t need a certified expert to explain that if you spend more than you earn on a routine basis, you might start to rack up debt. For people who regularly overspend on irrational purchases or live beyond their means, the consequences of these buying decisions can result in a powerful debt cycle that’s harder and harder to escape. While there are good types of debt that can help you establish your financial future successfully, others can be toxic to your ability to save or invest for the future. As our survey revealed, Americans with the highest amounts of credit card debt – $20,000 or more – had the lowest opinion of their own spending patterns. While more than 1 in 3 Americans with no credit card debt at the time of our survey claimed they were always responsible with their spending, only 1 in 10 who owed $20,000 or more could say the same. In contrast, we learned Americans with more in savings were the most likely to claim they managed their spending responsibly, and even Americans without student loans had a more positive perception of the way they balanced their budgets. When it comes to Americans living paycheck to paycheck, some of the people we surveyed admitted putting themselves in that uncomfortable position by spending heedlessly. They usually experienced regret at having spent the money in the first place. Even worse? On average, we found most people’s spending habits couldn’t cover their total expenses from paycheck to paycheck, and some Americans may be going days at the end of a pay cycle without enough money to get by. Thankfully, setting a proper budget (and sticking to it) can curb overspending, allow you to start saving for the future, and even help you reach your financial goals. You don’t have to put a moratorium on eating out or having fun, but doing it responsibly could pay off. We collected 1,000 responses from Amazon’s Mechanical Turk. Fifty-three percent of our participants were female and 47 percent were male. Participants ranged in age from 18 to 72 with a mean of 36 and a standard deviation of 10.06. Only employed participants who lived in the U.S. qualified to take the survey and were included in the analysis. No need to spend any of your hard-earned cash to share this study with your readers for noncommercial purposes. Just don’t do so irresponsibly – be sure to link them back to this page to allay any regret.